Tailings ponds are common to mining operations. They are what’s left over after hydrocarbons are extracted from mined earth. Composed of water, sands, clay, leftover bitumen, and some lighter hydrocarbons, tailing ponds represent a significant environmental problem. Some of the largest ponds in Canada cover over 176 square kilometers and hold enough liquid to fill the equivalent of 390,000 Olympic-sized swimming pools. Effective removal of excess hydrocarbons is an important component of a total tailings ponds solution. In this test, samples of extraction tailings were placed in two identical sample containers. Less than 1 gram of MB Bio was added to just one container (equivalent to 2kg/m3 of material). Both samples were mixed thoroughly and left uncapped at room temperature. After 6 days, the samples were weighed. 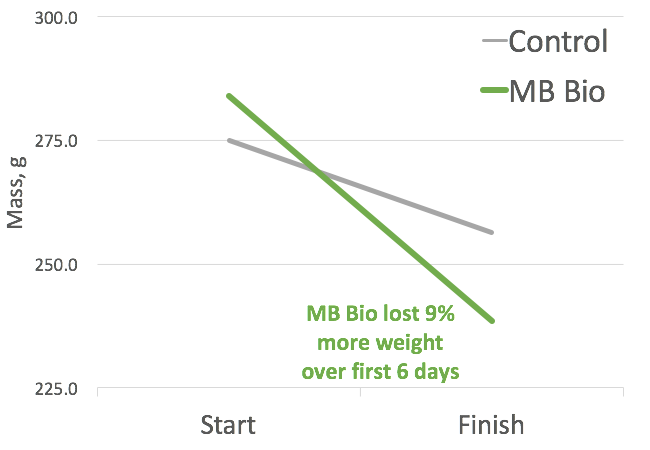 As shown in Figure 1, the MB Bio sample had lost 9% more weight than the control sample. After 21 days, the samples were tested for Total Petroleum Hydrocarbon or TPH under the EPA 418.1 guideline. These results are shown in Figure 2. 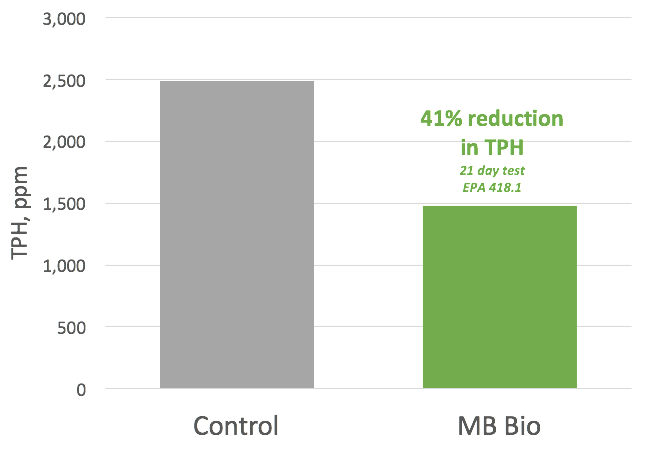 After 21 days, the MB Bio had converted 41% more hydrocarbons than the control. MB Bio is a specialized blend of bacteria on a super porous carrier that breaks down hydrocarbons, even long chained or ringed hydrocarbons, into smaller and smaller chains, eventually oxidizing them into carbon dioxide and water. For more information about MB Bio, please visit our product page or take a look at our case studies.